Weeknight dinners just got easier. There’s no need to thaw chicken breasts when you’re strapped for time. 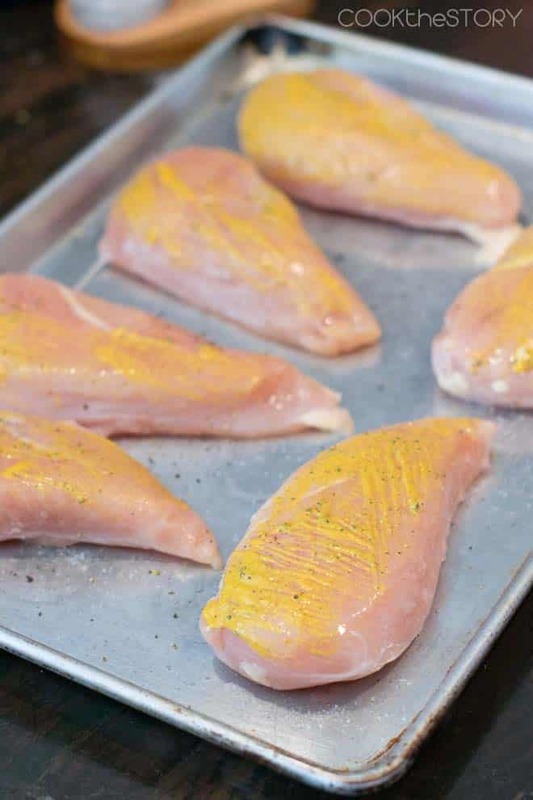 Here’s How to Cook Chicken Breasts from Frozen. Yes, directly from the freezer! 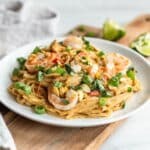 Strangely enough, one of the most popular blog posts on this website is the one with instructions for how to cook fish from frozen. That post was revolutionary for me. I had never thought of cooking fish from frozen until I was approached by a company that wanted me to experiment with it. 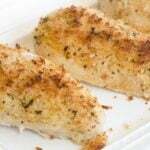 It was such a successful and convenient technique that now I always have frozen fish fillets in the freezer ready to go straight into the oven for a quick dinner. Those quick dinners got me thinking, could I do the same thing with chicken breast? Is it safe? I checked with the USDA and sure enough you can cook chicken breasts straight from the freezer. You just need to add about 50 percent more cooking time. Well, there’s one other thing you need to do. When you bring the chicken breasts home from the grocery store, you need to pack them properly. The reason is that when it comes time to cook them you can’t have a big heap of frozen breasts in the pan. They will not cook evenly at all. When you get your fresh chicken breasts home from the grocery store, put them in a single layer in a freezer bag. Lay the bag flat in the freezer, making sure that there is space around each breast. Alternatively, you can freeze them flat on a tray or plate and then transfer them to a freezer bag. Whichever way you do it, after they’re frozen you can jumble them up and put the bag upright in the freezer. The key is that the breasts stay separated. These chicken breasts were frozen on a tray and then put in a freezer bag. You can see that even though they were touching in the bag they aren’t really stuck together. Preheat the oven to no lower than 350ºF. If I’m doing breading, as I’ve done with the recipe below, I use a higher temperature to help brown the crumbs. 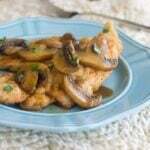 Put the frozen chicken breasts on a pan in a single layer. It’s best to use a broiling pan or a rack over a foil-lined pan. This way, any liquid from the chicken breast doesn’t leak out to steam them. But I’m usually lazy and just use my regular sheet pan. Mine’s this really good heavy-duty one and it works great and is ideal if you’re doing a high temperature like I often do. Doctor them up! Season them with salt and pepper and anything else you like. If you want to use a sauce (like BBQ sauce), it’s best to wait until the last 10-15 minutes of cooking time. If you want to do a breading, see the recipe below. But basically, I brush them with mustard and then sprinkle on some bread crumbs that have been mixed with a bit of oil to help the browning process. I use mustard because it’s easier to brush on and have the bread crumbs stick then it would be to dredge frozen chicken breasts in flour and then egg wash. This is a very simple solution. Bake the chicken breasts for 50 percent longer than they would normally take. 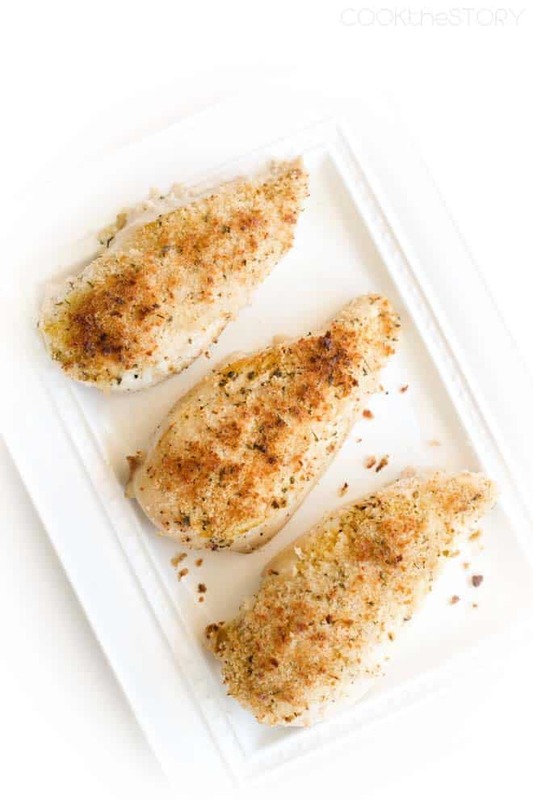 Unfrozen chicken breasts usually take 20-30 minutes at 350ºF. So for frozen, you’re looking at 30-45 minutes. It depends on the size of the chicken breast though, really. If you’re doing a breading, as I have done in the recipe below, the oven temperature needs to be higher. But it will still take nearly the same amount of time. Make sure to use an instant-read thermometer when you think the chicken breasts are done. The temperature needs to be 165ºF. A thermometer is the safest bet to make sure that they’re done. But if you know what you’re doing and trust yourself, you can cut into the thickest part of one and make sure that it’s not pink inside. Once you discover how easy this is and how delicious the chicken turns out, make plans to try another from-frozen recipe. 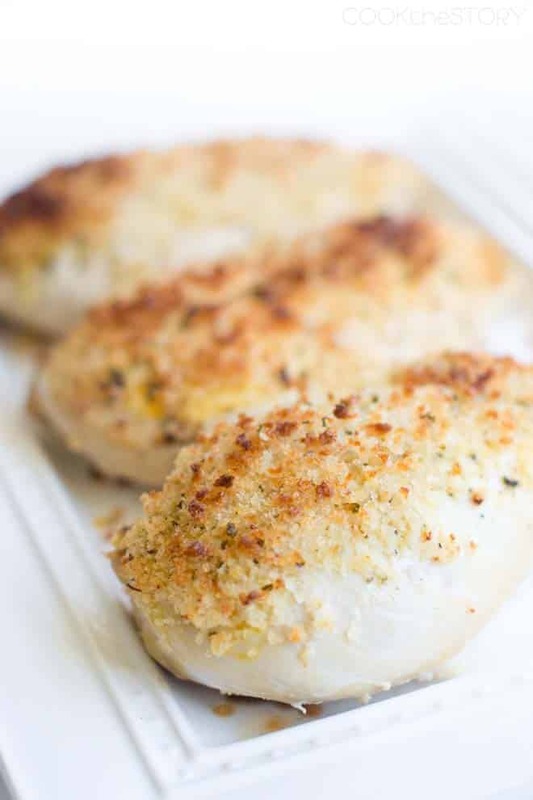 Here are some of my tastiest ideas, including Chicken Parmesan and Chicken Cordon Bleu from frozen. Yes, it really is possible to make those classics and so much more using frozen chicken breasts. There’s no need to thaw chicken breasts when you’re strapped for time. You pretty much cook them like normal but add 50% more cooking time. Preheat oven to 425F. Lightly oil a baking sheet. In a small bowl combine the breadcrumbs, oil, salt, pepper and garlic powder. Set aside. Bake until chicken is 165F according to an instant read thermometer, 30-40 minutes. I’m wondering why this chicken recipe has so much cholesterol?? 41% seems very high to me. I agree that it does seem high. But i just did some research and it seems that a chicken breast has about 119mg of cholesterol which is about 40% of the suggested 300mg per day. That’s crazy, right? Thank you so much, Christine, for researching the safety of cooking from frozen. I like your “rule of thumb” about cooking frozen chicken 50% longer. I want to try this with the boneless, skinless chicken thighs that I buy frozen from either Costco, Walmart, or WinCo. You see, my guys don’t like chicken breast because it is dry and grainy, they say. I also buy bone-in thighs and drums fresh when they are on sale, and freeze each piece individually in fold-top sandwich bags. I’m looking forward to trying your technique several ways, including brushing the chicken with a honey-mustard mixture (without breadcrumbs) as a flavorful glaze. I hope it works! What a time-saver! Thanks! You’re welcome, Nancy! I hope it’s been working out for you! I tried this recipe just as written. It was delicious! I will certainly be making this again. Fantastic! Thanks for letting me know, Toni! Your recipes are so practical, time saving and delicious. The chicken breasts in my freezer were too large to cook from frozen. In future I will follow your suggestion for pounding before freezing. Why have chicken breasts gotten so large lately??? But I decided to try the recipe anyway with a few mods. First, I separated the small part of the muscle and then cut the large part in half horizontally, giving me 3 pieces of about equal thickness per breast. I used avocado oil with the bread crumbs as it seems to tolerate heat better than olive oil. And I used Amora dijon mustard, the best mustard in the world IMHO! I baked these in a cooler temperature convection oven, 350 degrees, in the top third, which is the hotter part of my oven. I lined my baking sheet with heavy duty foil and then a sheet of non-stick parchment paper. I removed the cooked breasts when the instant read thermometer read 160. We like our chicken well done. But it was still juicy and tender inside, crispy on the outside, and absolutely delicious. Thank you! Gail, I’m so happy it worked for you. And I have no idea why chicken breasts have gotten so big. It’s weird. Thank you for the compliments as well. They mean a lot to me! Which pan or kind of pan it best to use? I have a small convection oven and I normally cover the cookie sheet with foil when I cook.. do I put the small wire rack it comes with on the pan or just put the chicken right on the pan? Amanda, You can put the chicken right on the pan or on the rack. Either way will work. You can cover the pan with foil as well. That won’t affect anything. I buy chicken breast at Walmart and I sometimes use them in different ways, from putting them in a Ziploc bag and marinade then shake them up and leave in the refrigerator for 1-2 hrs. I have them fully thawed out, yet with a oven temp of 425 degrees, how much higher can you go without burning them? I have an electric stove, yet prefer gas because it cooks evenly and NON messy, whereas it takes me almost 1hr and 30 mins to cook these AND leg quarters. Yes, the oven IS preheated but WHY is it taking so long for these 2 same foods to cook? I do have used a Pyrex/ Anchor Hocking 11 X 15 glass dish, with 1/2 ” water and covered with aluminum foil, and/or on an aluminum foil lined cookie sheet where the rack is in the middle of the oven. 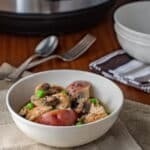 How should I attempt frozen chicken breasts or chicken leg quarters in a Crock Pot Slow Cooker? Tom, You should not try cooking frozen foods in the slow cooker. They end up at a dangerous (bacteria growth) temperature for too long. As to why your chicken is taking so long in the oven, I have no idea. Fully thawed out bone-in chicken pieces should cook within 45 minutes at 425. If it is still frozen it should cook in about 1 hour and 10 minutes. 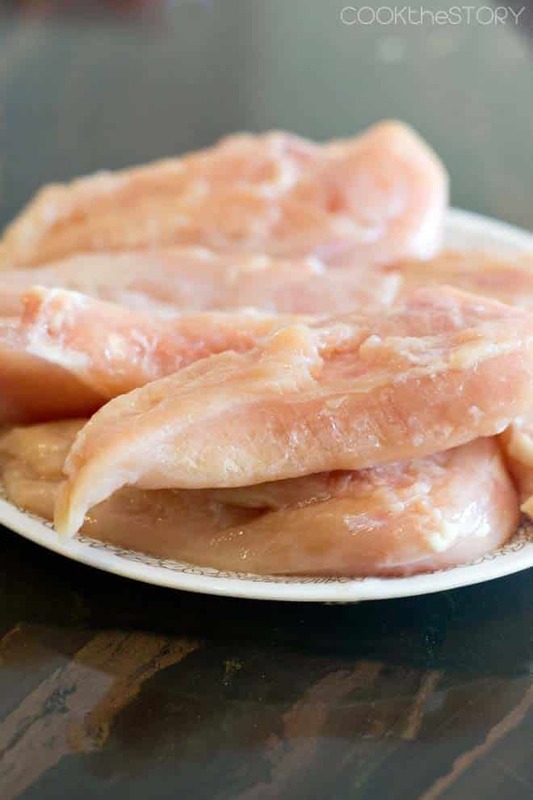 Thawed out boneless chicken pieces should cook in 20-25 minutes, frozen is longer, as discussed above. Under directions i think you left out to season the chicken because it looks like it is in the picture with the mustard spread. I didn’t have mustard so i lightly salted the bottom and put the seasoned breadcrumbs on top. Hope it doesn’t come out too bland. Cathy, Under step #3 in the blog post it says to season the chicken breasts. In the recipe for breaded chicken at the bottom, it says to season the breadcrumbs. I’m a little confused about what you wrote as you can buy frozen chicken breasts at (walmart) and they specifically say to not thaw before cooking. I.E. throw them in the oven. I find what works best for me is to pop them in the oven for 20 min at 425 and then cook them on the stove for a few minutes on both sides and chop them up a little bit with the seasoning thrown in the pan. Continuing to chop them if some are cooking faster than others and pulling them as soon as they aren’t pink for the optimum tenderness. Its SOO easy to overcook chicken into rubber so I prefer to have total control visually. Thank you! Great and simple recipe! Thank you so much for the recipe Christine. First time I cooked (ever) so I followed the directions exactly. After 40 min there was little pink in the middle so cooked it for 5 min more. Came out perfect. Moist and delicious. Raz, That’s great. Thanks for letting me know. I hope you venture into the kitchen again soon! Make sure when you are preparing to freeze that you pound them down to the same thickness. This way they will cook much more evenly. Do u cover them ? In the oven? I love this recipe! I’m a Pharmacy Technician as my main job and a server as my second job so I dont have the time to cool elaborate meals. This is revolutionary me in regards to simplicity and convenience! Thanks! Great idea about the mayo and buffalo sauce. As to the timing, it really depends on the size of the chicken breasts. I’m glad you liked the recipe! I do NOT like mustard and I absolutely LOVED this recipe! I appreciate you putting this together. Dinner was absolutely delicious. Thank you! Heather, So glad you liked it even with the mustard! Kath, you’re welcome. I hope you had a nice dinner! Tried this recipe tonight- it was great and easy. Instead of Panko breadcrumbs, I used Rice Chex cereal. Delicious, crunchy and gluten free! Will try oil instead of mustard as my youngest didn’t care for the mustard flavor. Thank you for sharing! Mar, glad you liked it! Note that the oil tends to freeze as soon as it hits the chicken and then the crumbs don’t stick as well. You could try mayonnaise instead of the mustard. When chicken breasts go on sale, I open the package and put each breast in a sandwich sized ziplock. Each piece of meat is sealed in its own bag and so easy to grab as many as I want! Jane, that is a fantastic idea. Thank you for sharing! Great recipe! I tried mayo instead of mustard and then sprinkled with Parmesan. Yummy! Anne, Great idea. I’ll try that next time. Quick and fantàstic way of cooking frozen food, but I wonder if it will keep all the properties as if it was live the night before in the fridge to unfrozen slowly. I think it turns out best if you let it defrost slowly in the fridge. The idea behind this is for those situations where you need to get dinner on the table right now and only have frozen chicken available. Then it is a good solution. In step 4, you state 30-40 minutes at 350 degrees. Further on, there is a recipe, which looks like what you use and it states, 425 degrees for 30-40 minutes. Which is correct? Actually, both are correct. At 350F, they will cook through in 30-40 minutes. But if you use a breading and want that breading to brown nicely, you need a higher oven temperature. They will still take at least 30 minutes and possibly longer, depending on their size. I am so sorry for the confusion. I’ve adjusted the blog post to reflect this. Hello, In step 4, you say bake for 30-40 minutes at 350 degrees. Further on, there is a recipe, which states, 425 degrees, 30-40 mins. Which is correct? I made this last night when I realized I had nothing thawed for dinner. I don’t like mustard, so I brushed some Olive Oil on the frozen breasts so the crumbs would stick. It was the best chicken I’ve ever made. Thanks for the recipe. You’re welcome, Joe! Thanks for letting me know! Hey Christine, you just saved my life! I’m a fifty year old guy who’s trying to eat healthier, but HATES to cook. I’ve had a bag of frozen breasts in the freezer for over a week because I just didn’t feel like dealing with them! Now I’m just gonna chuck em in frozen! I like your style. Thankyou. Jim, You’re welcome! LOL. I hope it worked out for you. Do we need to flip the chicken breast at any point during cooking? Daniel, No. It can stay on one side the whole time. And if you’re doing the breaded version in the recipe, you want it to stay crumb-side-up so that those crumbs brown on top. Thanks for doing the research! Our frozen chicken is in the oven now. Can’t wait to see what my picky little ones think. :) What would you recommend for a mustard/ dejon substitute? Hi Ray, You can use honey or mayonnaise instead of mustard. Can’t wait to hear how they turn out! Great to know, such a timesaver! Do you know if it will work with a bone-in breast? Mila, The rule of thumb for frozen chicken is that it takes 50% longer than when it’s fresh. I usually bake my bone-in chicken breasts for 40 minutes at 350F. So it would be an hour. Do test with a meat thermometer to make sure it’s 165F inside. I just tried this out tonight and it came out great. The only change I made was using a bit more mustard and paprika and minced fresh garlic instead of garlic salt. Thanks for the idea and post! Emilia, Thanks for letting me know. I’m delighted that it turned out so well for you! Dinner time game changer! I can not wait to try this! Great tips Christine!!! 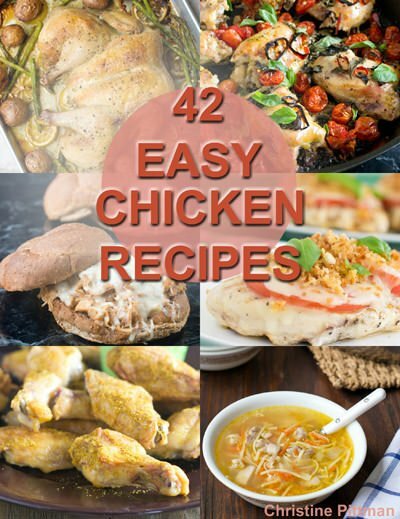 What a help to not have to remember one extra step, getting chicken out to thaw…this will be a timesaver for me and so many!!! Many thanks for doing the research.